So after my run in with their toffee flavor, the fine folks over at Gifford's contacted me about my experience. It was just a quick, honest conversation from people who care about their customers, not just their image. I appreciate that... and the pair of coupons they sent over. Most people I meet in the industry are nice like that, it's one of the things I love about running this blog. Ok, enough of that, I think it's time to check out another flavor from Gifford's. to crunchy sweet pieces of grandma’s peanut brittle"
But that's how you get my attention! I was afraid this one might be too buttery or salty, but it's quite nice actually. It's got an authentic, somewhat mild, brickle taste to every bite. 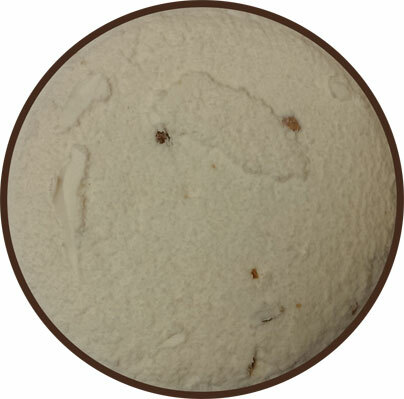 I wasn't sure how to describe it, but after a few more bites, I realize that you could easily call this one Cracker Jack ice cream. 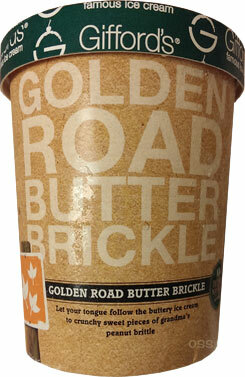 The brickle bits? Love them!! They are huge and fun, just fun. My only fear right now is that the second scooping won't be so chuck full of them. Mmmmmm, just a nice, sugary/peanut blend with a nice crunchy texture. Not too hard, but solid enough... kind of like Cracker Jack. There's even that backend aftertaste that you get from Cracker Jack. Man, I am glad I picked this one up. I almost changed my mind but I went for it and it worked out great. There's a rich complexity to the base that works great with the brittle. I liked it from the first bite, and then I liked it even more with every following bite. Thumbs up Gifford's! Nice job on this unique flavor. 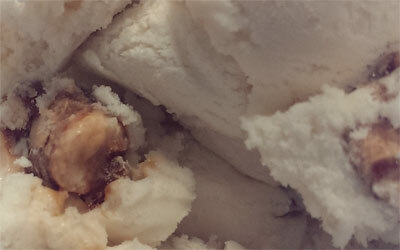 On Second Scoop: Oh yeah, just as much fun on the second scooping. So glad I took a shot on this one. This could have been done wrong so many ways but it aims to please and it succeeds. I love the complexity, I love the fact they keep everything in check, and yes, I love the brittle bits! Does the base flavor taste like "Butter Pecan"? nope, it's "buttery". 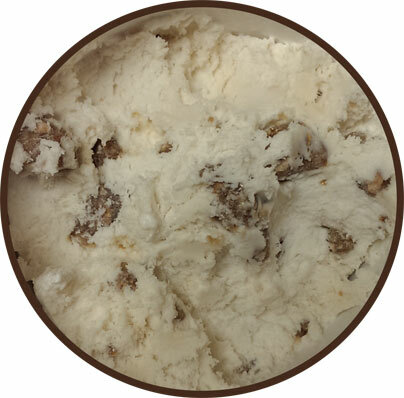 it doesn't really remind me of the salty/buttery base I've had in any butter pecan flavor. that's actually why I avoid flavors like this, they are usually overpowering with that salty/buttery factor.